1.That the Society shall be called the “LLANFYLLIN AND DISTRICT AGRICULTURAL AND HORTICULARAL SOCIETY” and local Classes shall comprise of the following District: All residents within a radius of 10 miles of Llanfyllin Institute. NOTE: Ring events and Open Classes as shown in the Schedule are open to competitors from any distance. Stock entered in Local Classes are eligible for entry in Open Classes on payment of entry fee. within 14 days after that day. the bona-fide property of the Exhibitor – grown, produced, or manufactured on the particular holding. 4. Only one attendant with each entry or pen will be admitted on the Showground. 5. Attendants will not be allowed to leave the Stock they are in charge of until the Parade at 3.30pm. 7. No animal can be exhibited in more than one Class, except in Ring events, Special Classes and Open Classes. No animals are eligible to compete in Silver Challenge Cups and other Special Classes unless they have competed in the Agricultural Section. 8. The Judges shall have power to withhold any prize if they are of the opinion that there is not sufficient merit in any of the Stock shown or sufficient competition for such prize to justify an award. 9. The Society reserves to themselves the right to cancel any Class, and to return the entries 3 days before the Show without being liable for compensation. 10. Exhibitors shall be responsible for any consequential or other loss, injury or damage including liability occasioned by or arising from any animal including dogs and horses, poultry or items entered for competition or display. 11. Should the right of any party to a prize be disputed, notice of the same must be given to the Secretary, IN WRITING, on the day of the Show before 7. 00pm.This refers to all classes. 12. Any person lodging a protest must deposit, at the same time, the sum of £1 which shall be forfeited to the Society (at the discretion of the Committee) if the protest be not sustained. 13. All parties exhibiting at the Society’s Show must be governed by the Rules and Regulations as interpreted by the Secretary. 14. No one will be allowed in the Ring while the Judges are engaged in making their awards except those who have duties to perform. Persons acting as Stewards are requested not to interfere or even speak to the Judges unless compelled to reply to a question asked, and should any person acting as a steward by an Exhibitor, he must leave the Ring before that class enters. 15. All Stock must be on the Show Ground by 9.00am promptly. Judging will commence at 9.00am. unscrupulous act; further any person proved guilty of discreditable conduct, shall forfeit the whole of their prize entry fees, also any prizes they may have been awarded or to those of which he/she or they may have been in charge, and in the event of being reported to, and the charge sustained by the Committee, such person or persons may be debarred from competing at the Society’s Show for a period not exceeding Five Years after the commission of the offence. 17. The decision of the Committee in all cases shall be final, and shall not be subject to any appeal. 18. ALL ENTRIES MUST ACCOMPANY THE ENTRY FEE, AND MUST BE POSTED OR HANDED TO SECRETARY OR E-MAILED. 19. NO ENTRIES TO BE REMOVED BEFORE 5.30PM. 20. 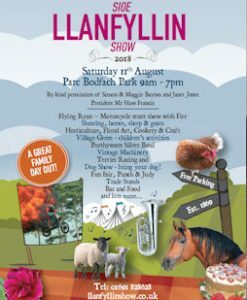 Exhibitors are advised to ensure that all animals entered in the Show are covered by appropriate Public Liability insurance, evidence of this may be requested by the Show organisers. 21. All prize money to be collected by 5.30pm on Show Day. If not collected you will forfeit money.